Kenneth Cooper written in 1968. My brother and I had read the book and were competing for the most points but like most things from childhood, it didn't last long. I re-read the book and decided to use it and collect points walking and running. This was mainly to help with the body-building and add an aerobic component to my training. I was also hoping it would help me to stop smoking. Before long after that first run I was soon able to cover a whole mile without walking. I then moeved up to 1.5 miles. Within weeks I had measured a new 3 mile lop course in Southeast Raleigh. The photo was taken in 1978. 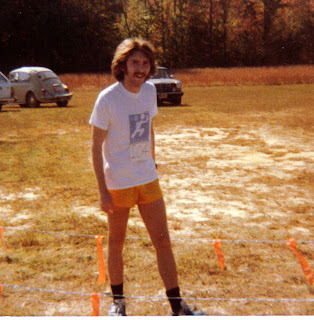 I was doing my Prefontaine imitation. This Friday at 6:30, I have invited members of my running clubs to join me in a celebration of running on that 3 mile loop. At the time I was living in a basement Apt on Lenoir St, just a few blocks from Downtown Raleigh. From the house the course goes on Boylan Ave. to Western Blvd. Turns right on Ashe Ave. by Pullen Park. Turn right on Hillsborough St and then bear right as it becomes Morgan St. Then a right turn on Boylan and back to the corner of Lenoir St. I'll have a report in a couple of days. 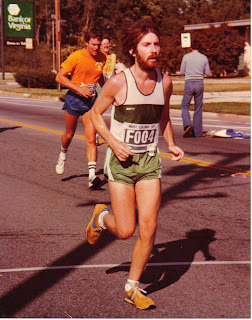 This photo is from the 1980 Virginia 10 miler. It was my favorite race and I ran it 15 years in a row. Is that 10 miler discontinued? In your 30 years of running how many total miles have you run? 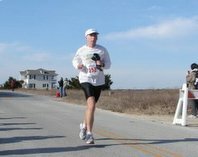 The Virginia 10 miler is still held in September. It began in 1974 I think and used to have world class runners every year. My 1st year was 1978 and I watched Bill Rodgers an Frank Shorter battle it out. Other years saw Rob De Castella and Rod Dixon among others. My total mileage is just under 28,000 miles. It would be a lot higher but in the years between 1992 and 1998 I ran very little. I call these the "Dark Years" Don't ask. Congrats on 30 years running! That is an amazing accomplishment. I have enjoyed getting to know you since discovering ultras last year and look foreward to seeing you again soon - Catherine's 50K most likely. Good luck at Western. This is such an awesome and inspiring blog!!! What a story and it's so cool you remember back to the time where it all started. The photo's are great! Keep running and keep on inspiring. You are living proof that the best people you could hope to meet, you will meet through running. I for one am glad we met!